Officers have spoken to a woman over photos apparently showing a World War One memorial bench being vandalised. 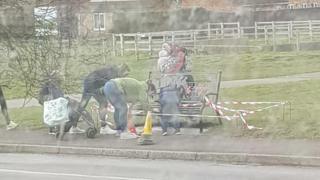 The names "Shell" and "Jane" were scrawled into wet cement under the bench in Horncastle, Lincolnshire, after it was installed on 18 February, according to The Lincolnshire Reporter. Photos appear to show the women leaning over a cordoned area around the base of the bench, as children look on. A woman was "involuntarily interviewed" over the incident, police said. Lincolnshire Police said it was "one woman who caused the damage" and officers were "not looking for anybody else". No arrests have been made, it added. The black metal bench, opposite Stanhope Hall, shows a silhouette of soldiers and a warhorse next to poppies, with the words "Lest We Forget" and "We Will Remember Them". One resident, Dawn Amos, said she was "furious" with the pair who showed a "total disrespect for our fallen heroes". "You can't get much lower than that," she said.